If you use Calibre, the veritable Swiss Army knife of ebook management, you might not realize it can also view and organize digital comic books—though it’s a little janky out of the box. A fresh installation of Calibre handles ebooks right out of the gate, without any tweaking. Throw some EPUB, MOBI, or other ebook formats at it, and it will automatically open all of them with the internal ebook reader packaged right with Calibre. When it comes to comic book archive files, like CBR and CBZ, however, things are a little different. Calibre can organize these files in your library, but if you try to read them, it’ll do one of two things. 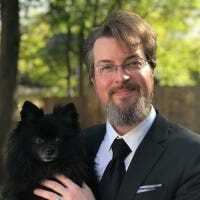 It either attempts to launch an external application based on whatever operating-system level file association you have set (but fails if there is no file association) or it launches its internal file reader—but only if you’ve expressly configured it to do so. RELATED: What Are CBR and CBZ Files, and Why Are They Used for Comics? 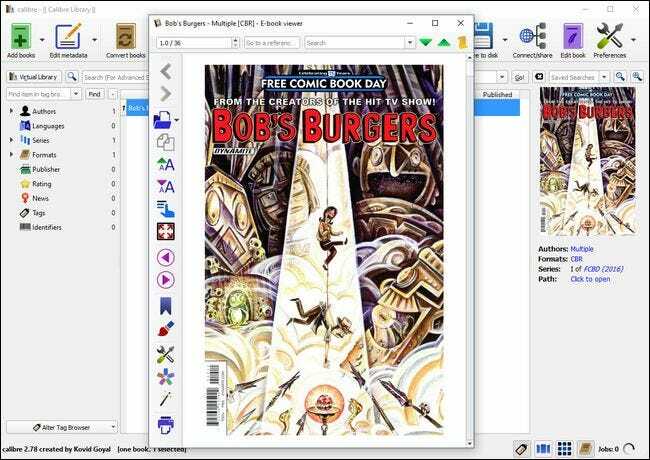 If you want Calibre to launch an external comic book viewer, that’s easy enough: simply install a third-party tool like the incredibly popular CDisplay Ex and it will automatically create the file association for you (if you need help manually creating a file association in Windows, check out our guide here). We recommend, however, enabling Calibre’s internal viewer too. It’s helpful if you’re just organizing comics and want to peek inside, and you can enable it without messing with your file associations. That way, you can still do your heavy reading with CDisplay, but Calibre can see inside your comics without needing to open a separate app. Here’s how to enable that. 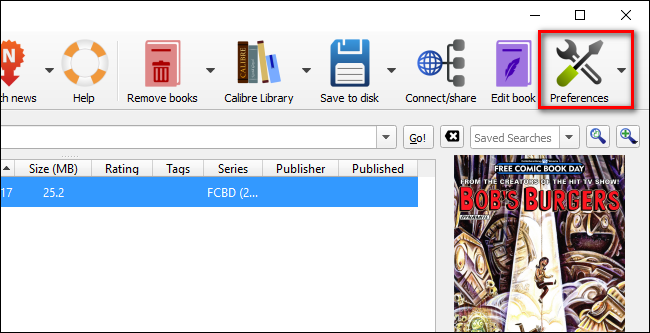 To enable comic book reading within Calibre, fire up Calibre and click on the “Preferences” icon in the upper right corner of the window. Within the Preferences menu, select “Behavior”. Within the Behavior menu, look for the column on the right hand side labeled “Use internal viewer for:” and check CBR and CBZ. Be sure to click “Apply” at the bottom to save the changes. But again, setting up the internal file viewer in this fashion does not change any system-wide file associations. So if you double-click a CBR or CBZ file from within Windows, it’ll open in your preferred comic reading app instead.